The day did not start off well. My schedule in the morning must work like clockwork. Two boys, ten and eleven years old, but be showered, dressed, breakfasted, lunches packed, and out the door. At the same time, I need to be showered, dressed (breakfasted—yeah, right), lunch packed, house closed down, and out the door. Some days, it works like a well-oiled machine. Some days . . . not. That day, it did not. That morning, it was my older son, Jason’s, hypersensitivity and hypoglycemia. His blood sugar had dropped, which made him irrationally emotional, and the only resolve was for him to eat—but because he was upset, he did not want to eat. While tears erupted, I had to manage my own emotions and frustrations over trying to get him to eat in order to ease the emotions that prevented him from eating. Finally, he relented and took in the cereal bars, the food hit his system, and his normally sweet demeanor began to reemerge. It is events like these that make life with my sons not “typical.” If I ever start to harbor any thoughts of ill will about that, I have to reflect on what they have already been through and conquered in their young lives. Both my sons were adopted as babies through foster care. They each faced things at very young ages that I could not imagine. My older kicked the heroin running through his body at birth in a few weeks. My younger, also drug exposed at birth, was terrorized and abused by an aggressive birth parent. Today they are both well-adjusted, happy boys, but special needs and challenges still arise. A few hours later, I was at work. One of my tasks for the day was to write an internal memo about a project on which my boss and a few others in my company had been working. They had raised $6000 towards a $7500 goal to “adopt a wish” for the Make-a-Wish Foundation. The $7500 would go to a single child’s wish. As I wrote, I told the stories of several children, all between the ages of four and nine, who had wishes granted. Like my sons, they had gone through things that most adults would find devastating. Their dreams were not cheap, but then that was understandable. None of us dreams to be under a budget, and these kids were certainly going to be oblivious to “what things cost.” It was not the point of the program to make them understand that. The point of the program was to give them the overwhelming experience of a miracle so that they could then expect a similar miracle in fighting the life-threatening challenge that they share with the others in the program. As I put the finishing touches to the corporate memo, one of my co-workers emailed me a link to something unfolding an hour away in San Francisco. 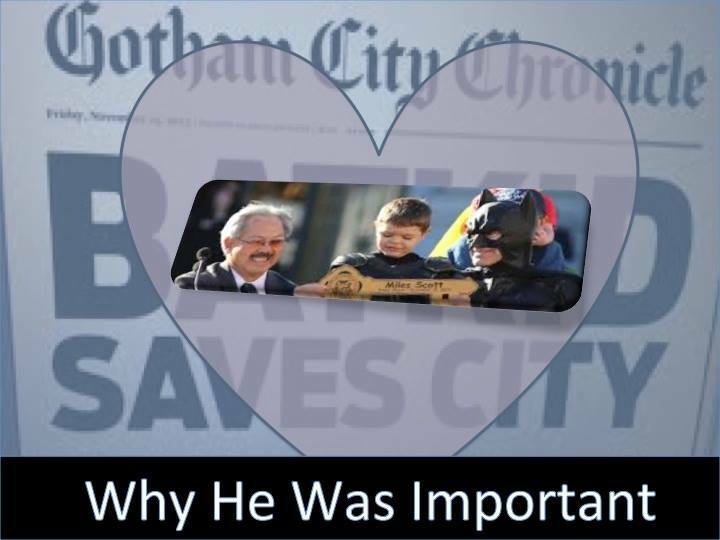 The BatKid had come to town, and the entire city and its surroundings had fallen in love with him. For good reason. Like my sons, five-year-old Miles Scott had already fought an adult-size battle early in his young life. When he was eighteen months old, he came down with leukemia. Miles did not focus on the battle behind him, however; he dreamed instead to be . . . Batman. “He is my favorite super hero,” Miles explained simply. Nuanced motivations are not required when one is five. News of Miles’s adventures filled Facebook, Twitter, and the media. It was easy casting; the part called for a metropolitan city to sit in complete and total awe as a masked superhero saved its day. We in the area grabbed our role and went for it with gusto. Those who donated to the funds that brought us BatKid were not likely to be sending the money to food stamp kids instead. In my workplace in our make-a-wish efforts, we vie for Airline, Cher, Eagles, or San Jose Shark tickets in a raffle. Others may forgo an extra lunch or a luxury item in order to give. It is also not to say that big prizes are routinely given in our society to those in need. All one has to do is turn on the TV to see cooks, sports enthusiasts, and no-discernible-talent people vying for big cash prizes. So the conundrum of one $7500 event versus one hundred $75 gifts is not a real one. It is also not the point. The point of BatKid was so much bigger than one Miles Scott, as adorable and deserving as he is. It was an act of many people coming together to make a dream come true. It was an act of healing and vision, to give a child that which he or she hoped for, and to demonstrate that hope is worth having. It is to show that we collectively can take a dream that should be all but impossible, and make it possible. Twelve thousand volunteers pulled the event together, and tens of thousands more participated. It is rare, but not unheard of, for a community of people to come together with such a singularity of vision. The fact that this was done for one single child is irrelevant. Similarly, when I tell the stories of my sons and their gay dad, it is not because I want people to care about only us. The point is we are representative of many like us who need that care. Some look at the adoption of babies born to drug addicts as their own lifetime “make a wishes.” LGBT parents adopting them into safe homes, to lives of care and protection, make their newborn dreams come true. It is saving one child at a time. The profound effect is also that of making strangers care about one another. When strangers care once, they then know how to care again, and again and again. Caring once allows us now to imagine how we can continue and help more children, and maybe more adults. It is the contagion of ideas and willingness to help, aid, and love. Usually it takes a mass shooting, a terrorist event, or something horrible to create this mindset. This was not a dire situation. We were not desperate to collectively get over a shock. On the contrary, it was an effort of hope, love, charity, and the imagination for something wonderful. We collectively looked at an impossible dream and made it a reality. For Miles, it was a great day. For those of us in its midst it was a necessity. We needed to know it could happen. We needed to know that the possibility of making it and other impossible dreams happen is within our grasp. It was a journey that rescued us from cynicism and took us into a community of hope. Holy paradoxes, Batman. We thought we were doing something great for this little kid, and he may have been the one who rescued us, after all. This entry was posted in Uncategorized and tagged Batkid, Batman for a day, gay dad, Make A Wish Foundation, Miles Scott, San Francisco make a wish, special needs kids. Bookmark the permalink. You brought tears to my eyes. Love what you shared about your own little superhero family, and about why Batkidis important to us all. Thank you.